The stories of the four Hands of the Cause appointed by Bahá'u'lláh are among the most wonderful and uplifting testimonies of love for Him, of dedication to His Cause, of sufferings and imprisonments in His path, of utter self-effacement, of unrelenting whole-hearted service to the community, and of memorable achievements. A full account of their eventful lives is beyond the scope of this book,1 but the following stories will at least provide an outline. 1. A good deal of research on their lives has been carried out by the learned scholar of the Faith, Dr Shápúr Rásekh, and published in Persia in the Bahá'í periodical Ahang-i-Badí', Nos. 3-5 (BE 107) and Nos. 7-12 (BE 129). The author is indebted to Dr Rássekh for much of the material in this chapter. Its waves toss pearls under the great wind's thong. Who of life's gift has never had a share? The first time he was imprisoned was by order of Hájí Mullá 'Alíy-i-Kaní,* the highest religious dignitary of Tihrán. This is believed to have been around 1868. The Pen of Bahá'u'lláh addressed a Tablet6 to this clergyman which is wrathful in its tone and highly condemnatory in its contents. He informs this proud and tyrannical high priest that the Prophet of Islám wept aloud in the highest paradise because of his wicked deeds. He sternly rebukes him for issuing death warrants for the believers, proclaims to him the greatness of His Cause, asserts that if all the powers of the earth were to be leagued against Him they would utterly fail to prevent the establishment of His Faith in the world, and warns that God lies in wait and is watchful of his doings. In other Tablets Bahá'u'lláh foreshadowed that God would soon strike him down in the same way as He did the 'Wolf' and the 'She-serpent',† and this what happened. It is not known exactly how long Mullá 'Alí-Akbar was kept in this prison, but some years later in 1872 he was again taken to prison by the orders of Kamrán Mírzá the Náyibu's-Saltanih, the Governor of Tihrán.‡ This imprisonment, which lasted seven months, began only three days after his marriage to a certain Fátimih Khánum who became his devoted consort throughout his eventful life. It is reported that at the time of his marriage he was living in a dilapidated room and his earthly possessions consisted of a sheepskin and a kettle! * For his involvement in the martyrdom of Badí' see vol. 3, p. 191. † see above, ch. 6. ‡ He was a son of Násiri'd-Dín Sháh, and an influential personality. 5. Memorials of the Faithful, pp. 10-11.
stocks on his feet. He suffered greatly in this prison. In a Tablet7 Bahá'u'lláh describes how the inmates of the highest Paradise have raised their voices and announced the glad-tidings that 'Alí-Akbar had entered the prison in the path of God. He showers upon his soul His blessings and His love, and denounces the actions of the oppressors. In another Tablet8 He states that the Concourse on High have lamented for his sufferings, and urges him to become exhilarated with an abiding joy for he has endured severe hardships in the path of his Lord. Soon after his release from this prison he travelled to northern parts of Persia, where he was able to enthuse the believers and galvanize them into action. Bahá'u'lláh, in a Tablet9 revealed after this journey, praises his work, states that God has chosen him for the service of His Cause, and asserts that the greatest service to His Threshold is that of uniting the souls and causing them to love each other. He directs him to be engaged in this type of activity at all times, and assures him of divine assistance in his life. 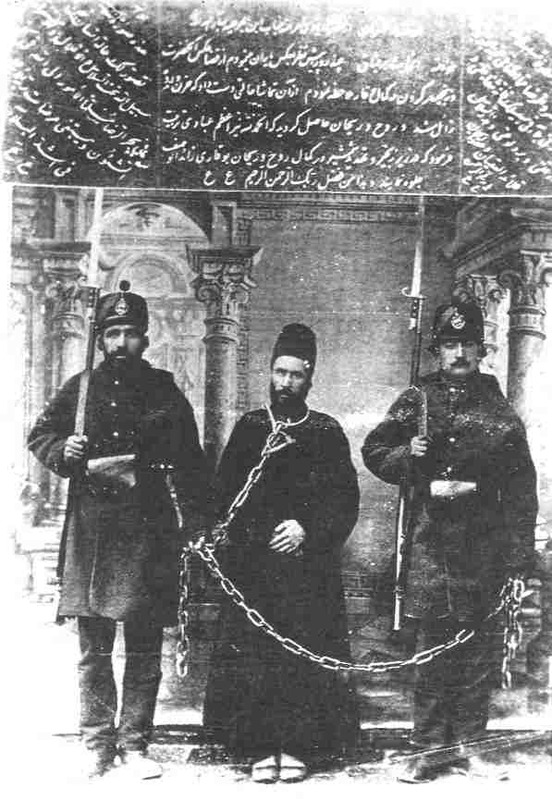 One of his imprisonments, which lasted about two years, was noteworthy in that Náyibu's-Saltanih arrested a number of outstanding personalities among the Bahá'ís in 1882 and interrogated them extensively about the Faith. * Another imprisonment was around the year 1887 and finally his two-year imprisonment which began in 1891, the first part in the prison of Qazvín for about eighteen months in company with Hájí Amín and the remainder in the prison of Tihrán. It was on the occasion of their imprisonment in Qazvín that Bahá'u'lláh revealed the celebrated prayer† for the Hands of the Cause. * For further details see below, pp. 379-80. † see above, p. 288. ‡ see vol. 3, pp. 200-201, and Appendix 1, for these two incidents. His amanuensis, Mírzá Áqá Ján, to send a copy of the Obligatory Prayers to Persia as a favour to Mullá 'Alí-Akbar who had asked for them. He confirms that the Obligatory Prayers had been revealed a few years earlier. Mírzá Áqá Ján gives the date of this release as one and a half hours after sunset on 27 October 1887. In numerous Tablets addressed to Mullá 'Alí-Akbar, Bahá'u'lláh urges him, as He does other Hands, to move around the community and instil into the minds of the believers the power of the Faith, to illumine their faces with the effulgent light of His Revelation and to ignite within their hearts the fire of the love of their Lord. It must be stated that one of the great services that all four Hands rendered to the Cause was the stewardship of the Bahá'í community after the ascension of Bahá'u'lláh. Through their loving care and vigilance they protected the believers from the onslaught of the Covenant-breakers, and enabled the faithful to remain steadfast in the Covenant. 12. Unpublished compilation, National Archives Committee, no. 15, p. 414.
lifetime of the Manifestation, his yearning made him hasten to Bahá'u'lláh, Who received him with grace and favor, and showered blessings upon him. He returned, then, to Írán, where he devoted all his time to serving the Cause. Openly at odds with his tyrannical oppressors, no matter how often they threatened him, he defied them. He was never vanquished. Whatever he had to say, he said. He was one of the Hands of the Cause of God, steadfast, unshakeable, not to be moved. † For a brief account of his noble life see vol. 3, p. 253-8. His bounty so that he may be enabled to raise the standards of victory in His Name and arise to serve His Cause when he is older. In this prayer Bahá'u'lláh describes him as one who in his tender years had travelled a long distance seeking to meet his Lord, and this he had achieved when he attained His presence. Soon after his return home he tasted the agony of imprisonment and torture when, in the company of his illustrious father, he was consigned to the dungeon of Tihrán. A brief account of this episode is given in a previous volume. * As he grew up Ibn-i-Asdaq often accompanied his father on his teaching tours throughout Persia. Thus he became imbued with the spirit of service to the Cause of Bahá'u'lláh, and eventually developed a passionate love for Him, a love that knew no bounds. He was about thirty years of age when he sent a letter to the presence of Bahá'u'lláh and, among other things, begged Him to confer upon him a station wherein he might become completely detached from such realms as 'life and death', 'body and soul', 'existence and nothingness', 'reputation and honour'. The gist of everything Ibn-i-Asdaq requested in this letter was the attainment of the station of 'utter self-sacrifice'; a plea for martyrdom, a state in which the individual in his love for his Beloved will offer up everything he possesses. It is an interesting thought that in one's quest for 'self-sacrifice' it is inappropriate for the soul to seek the station of utter nothingness and complete non-existence, for even these can become the means of attachment to oneself. * see vol. 3, pp. 266-7.
confined to the shedding of blood, as it is possible to live and yet be counted as a martyr in the sight of God. In this Tablet Bahá'u'lláh showers upon him His blessings, for he had offered up his all to his Lord. Two years later Ibn-i-Asdaq again asked for martyrdom. Bahá'u'lláh assured him in a Tablet16 that God had bestowed upon him the station of a martyr, and addressed him as Shahíd-ibn-i-Shahíd (martyr, son of the martyr). In this way both father and son, without physical martyrdom, were given this lofty station. Ibn-i-Asdaq attained the presence of Bahá'u'lláh once more in 'Akká. In a Tablet17 Bahá'u'lláh asserts that on this visit his ears were blessed to hear the shrill voice of His exalted Pen, his eyes to behold His Countenance, and his heart to turn to Him. He bids him illumine the hearts of men through the effulgent rays of His utterance, and brighten their eyes by the light of His Countenance. In every Tablet revealed in his honour by Bahá'u'lláh, one finds words of praise and appreciation for his devoted services, as well as counsels and exhortations for the living of a saintly life. * see vol. 1, p. 35n. 16. Unpublished compilation, National Archives Committee, no. 27, p. 314.
flame of fire among the loved ones of God, so that every soul may sense the heat of the love of their Lord from him. After the ascension of Bahá'u'lláh Ibn-i-Asdaq continued in his devoted services to the Cause. Along with the other Hands of the Cause, he promoted the Covenant of Bahá'u'lláh among the believers, instructed them in its significance and assisted them to remain steadfast in the face of the Covenant-breaking that occurred at that time. The range of his travels was extended during 'Abdu'l-Bahá's Ministry. He visited India and Burma, 'Ishqábád and even Europe where in 1919, accompanied by another believer, he personally presented a Tablet* addressed by 'Abdu'l-Bahá to the Central Organization for a Durable Peace at The Hague. He also attained the presence of the Master several times in his life. Among his other outstanding services was that of helping to organize a teacher-training institute for Bahá'í women in Tihrán for the first time. He also delivered to the Sháh a treatise penned by the Master during the lifetime of Bahá'u'lláh and known as Risáliy-i-Síyásíyyih (Treatise on Politics). His contribution as a writer was no less significant. For instance, in 1919 he produced, with the assistance of other Hands of the Cause, a refutation of false accusations against the Faith published by Professor Edward Browne in his books. He also wrote various papers on the subject of the Covenant, in which he explained the station of 'Abdu'l-Bahá as the Centre of the Covenant and the authorized interpreter of Bahá'u'lláh's Writings, refuted the misrepresentations and false accusations of the Covenant-breakers and exposed their malicious intention to subvert the edifice of the Cause of God. He wrote this material during his last pilgrimage in the Holy Land and sent it to the friends in Tihrán. Ibn-i-Asdaq lived longer than all the other Hands, and passed away in Tihrán in 1928. * Known as the 'Tablet to The Hague'. (the son of Abhar) embraced the Cause through association with his father Mírzá Ibráhím-i-Abharí, who was one of the divines who became a believer in the early days of the Faith. After Bahá'u'lláh's declaration in Baghdád many Bábís were confused about the position of Mírzá Yahyá and his claims. Ibn-i-Abhar, then a young man, sought clarification from his father on this point. His father, who had already recognized the station of Bahá'u'lláh, advised his son to investigate the truth for himself by studying the Bayán* carefully. The perusal of that Book enabled Ibn-i-Abhar to discover and believe that Bahá'u'lláh and no one else was the Promised One of the Bayán, and he joyously embraced His Cause. From that time onwards he grew spiritually and was transformed into a new creation by the potency of the Words of Bahá'u'lláh. Ibn-i-Abhar went through a turbulent period soon after the death of his father in 1874. The details of the plots against him and the confiscation of all his possessions by his enemies are beyond the scope of this book. In 1876 he sent a letter to the presence of Bahá'u'lláh asking whether it was more meritorious to lay down one's life for the love of God or to teach the Cause with wisdom and the power of utterance. In a Tablet20 Bahá'u'lláh counselled him that the latter was preferable. He states that after the martyrdom of Badí' He had advised the believers to act with prudence and care and not volunteer to give their lives. Martyrdom† in the path of God is undoubtedly the greatest bounty provided it takes place through circumstances beyond one's control. He urges Ibn-i-Abhar in this Tablet to engage himself in teaching the Cause with great wisdom. * The Mother-Book of the Bábí Dispensation, revealed by the Báb. † Bahá'u'lláh has ordained teaching the Cause to be as meritorious as giving one's life in His path. For further details see vol. 2, p. 94.
believers that the divines of the city of Zanján rose up against him and consigned him to prison. The conditions of prison life were extremely cruel, yet this godly man endured dire hardships in a spirit of resignation and forbearance. According to his own statement, his imprisonment lasted fourteen months and fifteen days. He attained the presence of Bahá'u'lláh about the year 1886. In a Tablet21 revealed in his honour Bahá'u'lláh reminds him of the time he attained His presence when He showered his bounties upon him and enabled him to hearken to His sweet voice, a voice to which were attracted all created things. In the same Tablet Bahá'u'lláh directs Ibn-i-Abhar to pass through the cities, and even as a breeze that stirs at the break of dawn to shed upon whomsoever will turn to him the sweet savours of His loving-kindness and favours. This Ibn-i-Abhar did for the rest of his life. He chose Tihrán as his residence and travelled far and wide throughout Persia. His teaching exploits and loving care for the believers contributed in a large extent to the growth and consolidation of the Bahá'í community in that country. In one of His Tablets22 Bahá'u'lláh states that Ibn-i-Abhar was created to extol God and magnify His name, to teach His Cause and to serve Him. Because the food in prison was inadequate, a few Bahá'ís sent food to him regularly. Two Bahá'í women, who devoted their time and energy to serving him, posed as his sisters and brought food and other necessities for him every day. As there was no paper available for prisoners to write on, Ibn-i-Abhar used to write letters in very small characters on the wrappers of sugar cones,* tea or candles, an send them out with the two ladies. He even wrote some long letters in the same fashion for non-Bahá'ís in answer to their questions and proving the truth of the Message of Bahá'u'lláh for them. These letters were later compiled in their original form, producing a small book. In spite of all the hardships he underwent, he succeeded in teaching the Faith to a few people in the prison and enabled them to recognize the station of Bahá'u'lláh and embrace His Faith. * In those days sugar was made in the form of large cones about 10 inches high and 5 inches in diameter, which were usually wrapped in thick blue paper. The cone had to be broken into small pieces. May my life be sacrificed for your true loving-kindness and for the tears you have shed in the path of the Incomparable Friend. However, the situation did not justify weeping and lamenting. Because the first abode to which the wayfarer arrives in the path of love is that of renouncing life, possessions, rank and position. Was there ever an evening that I spent in your presence when you did not hear, the next morning, the reciting of the prayer, 'O Thou whose tests are a healing medicine unto such as are nigh unto Thee?' Now that this prayer has been answered, we must glorify God and render our thanks to Him. Would it be fitting for He who is the Ruler of all the nations and the Lord of all creation to accept tribulations in order that mankind might be freed from the fetters of prejudice, liberated from attachments to this mortal world and disentangled from animalistic evil passions, while this insignificant being, who considers himself as one of His servants, be exempt from similar sufferings? * Bahá'u'lláh designated women believers as 'leaves'. A photograph taken in the prison of Tihrán. but their bounty will last in the world of the spirit till eternity. Ibn-i-Abhar was still in prison when the news of the ascension of Bahá'u'lláh reached him. He was heartbroken and filled with grief. For days he was unable to calm his emotions. He wrote a letter to 'Abdu'l-Bahá seeking His help in overcoming his heavyheartedness. 'Abdu'l-Bahá wrote a Tablet to him which brought great comfort and consolation in this bereavement. He advised Ibn-i-Abhar to read the Qur'án during his confinement; it was the only book available in the prison. the earlier teachers who had been despatched to that vast country during Bahá'u'lláh's and 'Abdu'l-Bahá's Ministries. It must also be noted that Ibn-i-Abhar travelled altogether eleven times to the Holy Land and attained the presence of the Master. An interesting episode in the life of Ibn-i-Abhar is the story of his marriage to Munírih Khánum, the daughter of the Hand of the Cause Mullá 'Alí-Akbar. After the ascension of Bahá'u'lláh, Ibn-i-Abhar (who was then in prison) made a vow to devote his whole life to the service of the Cause. A certain Persian lady by the name of Fá'izih Khánum suggested to 'Abdu'l-Bahá in person that it was time Ibn-i-Abhar got married, and suggested the above-named Munírih Khánum. 'Abdu'l-Bahá asked one of His sons-in-law to approach Ibn-i-Abhar and convey to him the timeliness of his getting married. But Ibn-i-Abhar was adamantly opposed, saying that if he married he would become involved with obligations which would result in the breaking of his vow. At last 'Abdu'l-Bahá summoned Ibn-i-Abhar to His presence and directed him to return to Tihrán and marry the daughter of Mullá 'Alí-Akbar. Ibn-i-Abhar brought up the subject of the vow. 'Abdu'l-Bahá went close to him, nudged him with His shoulder and said, 'My good man! I am the Centre of the Covenant; when I say you will not break your vow by marrying, you will not!' 'Abdu'l-Bahá also sent a message to Mullá 'Alí-Akbar and informed him of the situation, saying that Fá'izih Khánum had persisted with her request several times. When Ibn-i-Abhar arrived in Tihrán, 'Abdu'l-Bahá directed the Hand of the Cause Mírzá Hasan-i-Adíb to arrange the wedding within nine days of receiving His message. The Master sent a sum of money for the marriage feast, and the Greatest Holy Leaf a simple dress for the bride. greatly intensified their teaching activities, and as a result many souls, some of them highly educated and influential people, joined the ranks of the believers in Persia. A special service rendered by Ibn-i-Abhar was the promotion of the education of women. He and his wife played an important part in the advancement of women in Persian society. In 1909 a special committee was formed for the liberation of women, and Ibn-i-Abhar and his wife were both members of this committee. Around the year 1910, an assembly formed exclusively of women was established, and became known as the Spiritual Assembly of the Bahá'í Women. The wives of Mullá 'Alí-Akbar and Ibn-i-Abhar were both members. This Assembly, which lasted for seven years, turned to the Spiritual Assembly of Tihrán, whose members were exclusively men, for guidance on basic issues. With the encouragement of Ibn-i-Abhar, his wife Munírih Khánum founded the first Bahá'í school for girls in Tihrán. Ibn-i-Abhar passed away in Tihrán in 1917. Mírzá Hasan-i-Adíb was a distinguished and learned man who combined the knowledge of Islámic theology, as a divine, with literary erudition. Before embracing the Faith he ranked high in the literary circles surrounding the royal family, and made important contributions to the production of various literary works. He was at one time installed as the Imám-Jum'ih (a high religious post) and a teacher at Dáru'l-Funún, the only school established on the pattern of a western educational institution. The school was usually attended by members of royalty and the sons of influential people. In recognition of his outstanding literary accomplishments he was given the title of Adíbu'l-'Ulamá (Literary man of the Ulama). He also taught religious subjects to a number of would-be divines. contact with the renowned Nabíl-i-Akbar, and eventually saw the truth of the Faith, recognized the greatness of the Revelation of Bahá'u'lláh and acknowledged the awe-inspiring station of its Author. In the year 1889 he became a devoted believer; he was in his early forties at the time. All his learning and erudition were now harnessed to the new powers which the Faith of Bahá'u'lláh had conferred upon him. Soon his heart became a wellspring of divine melodies. The soul-stirring poems he wrote proclaim the advent of the Day of God and, in offering up his all in the path of his Lord, serve as ample testimony to the intensity of his faith and the exaltation of his rank. No wonder that soon after his entering under the shadow of the Cause, Bahá'u'lláh designated this great spiritual being as one of the Hands of His Cause. Mírzá Hasan-i-Adíb did not have the bounty, as the other Hands had, of meeting Bahá'u'lláh. However, he had the honour and the privilege of attaining the presence of 'Abdu'l-Bahá. During the Ministry of the Master, he dedicated all his being to the service of the Cause. He became a tower of strength for the believers and a great teacher of the Faith. His pen was no less active. He wrote several books on proofs of the Faith and its history. His poems were soul-stirring and the friends were inspired and uplifted by them. He had a major role in the formation of the Spiritual Assembly of Tihrán, and served on that body as its chairman. Mírzá Hasan-i-Adíb was deeply interested in the education of Bahá'í youth. About the year 1904 a learned Bahá'í known as Sadru's-Sudúr had established the first teacher-training class for Bahá'í youth in Tihrán. It was a daily class which lasted for several years, and the students became well-versed in various aspects of the Faith and other religions. When Sadru's-Sudúr died about five years after the foundation of the youth class, Mírzá Hasan decided to teach in his place. Assisted by a few other knowledgeable Bahá'ís, he supervised the youth class for some time. Boys' School in Tihrán. Mírzá Hasan-i-Adíb played a significant part in creating this prestigious institution, which was considered for years the foremost educational establishment in the country. This school was also the forerunner of several other Bahá'í schools in various parts of Persia. The Tarbíyat Boys' School and the Girls' School by the same name, together with all the other Bahá'í schools in major cities, were closed down in December 1934 by order of the government for not heeding a warning by the Ministry of Education (headed by 'Alí-Asghar-i-Hikmat, a well-known Azalí) that the schools would officially be closed if they failed to remain open during Bahá'í holy days. Despite several representations by the National Spiritual Assembly, the authorities remained adamant and all the Bahá'í schools in Persia were closed down after closing on a Bahá'í holy day. In 1903 'Abdu'l-Bahá directed Mírzá Hasan-i-Adíb to make a teaching trip to Isfahán. This journey took place at a time when a great upheaval was about to take place in Yazd through the machinations of the Mujtahid of Isfahán, Shaykh Muhammad-Taqí (the Son of the Wolf). The presence of Mírzá Hasan in Isfahán put fuel to the fire; a serious upheaval took place in the city resulting in great sufferings for the Hand of the Cause. He at last succeeded in departing from the city without being noticed by the many guards whom the wicked mujtahid had especially posted in various quarters for the sole purpose of arresting him. From there Mírzá Hasan went to Ábádih and Shíráz, where he was able to teach the Cause to several people. Then he travelled to India, and eventually to the Holy Land where his soul was exhilarated by coming in contact with the Centre of the Covenant of Bahá'u'lláh. There his whole being was illumined with the effulgent rays of 'Abdu'l-Bahá's presence. He returned to Persia as a flame of fire ignited by the hand of the Master, and continued in his highly meritorious services until his death in 1919. His resting-place is in Tihrán, in common with the resting-places of the other three Hands of the Cause.